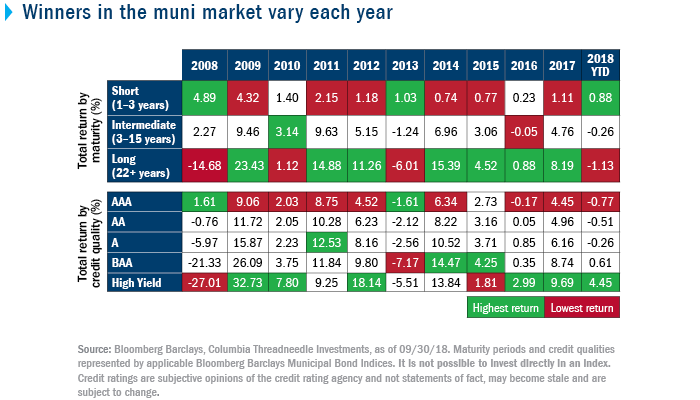 The latest #chartonthego highlights the primary sources of return in the municipal bond market over the past decade. Duration risk and credit risk are the primary drivers of income and total return in the muni bond market. These factors may outperform at different stages of the economic cycle. Allocating across maturity and quality spectrums could uncover more opportunities. Shorter duration, high-quality municipal securities could offer stability during periods of heightened volatility. But longer and lower quality bonds could provide a significant yield advantage that bolsters total return potential. Blending these exposures with a core allocation to bonds of targeted maturities and qualities may smooth the ride for investors. The Bloomberg Barclays Municipal Bond Index is an unmanaged index that is considered representative of the broad market for investment-grade, tax-exempt bonds with a maturity of at least one year. It is not possible to invest directly in an index.